Most of The Netherlands is covered in a blanket of snow right now, but many municipalities have been working hard to clear all that snow from the streets and cycle paths. 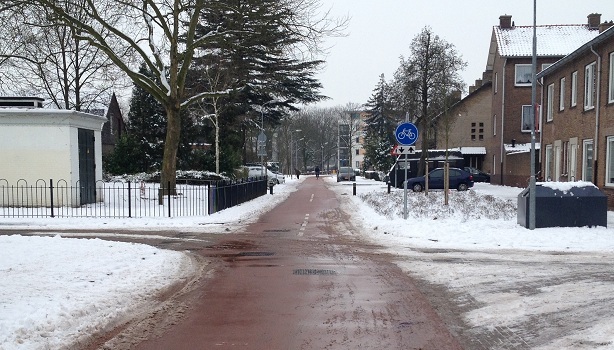 ’s-Hertogenbosch did a good job and although it had snowed for almost 24 hours most of the main cycle routes in the city were perfectly okay to use. Many people got on with their daily business on their bicycles. I thought it was beautiful to see and I hope you also like this relaxed* ‘dance’ of people on bicycles in the snow. The weather was still pretty cold the following morning. ’s-Hertogenbosch is situated just below the coldest spot on the map. A cold morning. ’s-Hertogenbosch is situated just below the coldest spot on the map of the Netherlands. The city published a short video on how the streets and cycle tracks are cleared of snow and ice. They are brushed first and then a mixture of water and salt makes the last snow and ice melt. Traditionally this is only done on main routes and not in 30km/h residential zones. Only if those zones form part of a main cycling route they are cleaned. But -despite comments by citizens- the city keeps forgetting one such new route used by hundreds of school children (Kamerlingh Onnesstraat – Buys Ballotstraat if you are reading city of ’s-Hertogenbosch: the newly designated ‘Rode Loper’ route to Rietvelden and beyond). This route is probably not included in the to-be-cleaned routes yet and remains very slippery. Clearly not how it should be on a main route*. But apart from that omission, the efforts by the city make cycling still very much possible almost everywhere, even in these weather conditions. The municipality of ‘s-Hertogenbosch does read my blog! After my remark of the new route that had not yet been cleared they quickly rectified that omission! The route is now perfectly clear and usable, just like the other main cycle routes. A new cycle route that wasn’t cleared of snow and ice earlier, was now! This cycle route runs through a residential area and only the cycle route has been cleared, not the route that would be normal for motorised traffc to take. The cycle route is more important here. 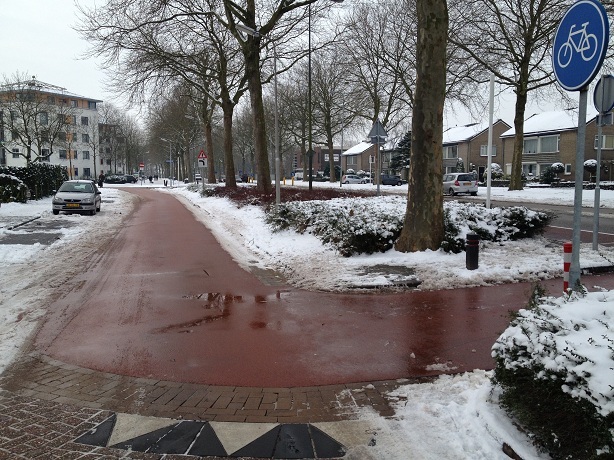 Seems that brine(pekel) would be the most effective on cyclepaths. Brine is exactly what the city uses for the cycle paths. I visited the Department for Public Works since I wrote this blog post and I got a full tour and explanation. I will get into the gritting proces in more depth in an upcoming post. I use salt brine for anti-icing and de-icing at work in Ontario, Canada. I’m very interested in getting as much information about 23% salt brine as possible. Een stukje van het rode fietspad dat wij ook dagelijks nemen naar ons kantoor. Viel me al op dat het ineens wel schoon was. Bedankt!!! 40 deg in Sydney right now (just after midday). No snow just at the moment. Den Bosch looks appealing! No snow, but you’ve got that bloody helmet law… Pity. We’ve had some bitter winter weather here, while the past couple of years had been very mild. The NL have it sorted. Was a nightmare cycling into Norwich this afternoon, and a sure guarantee that tomorrow morning things will be as challenging. Cars are a massive problem, salt the Norwich roads and let’s drive as fast! Looking forward to changes in UK? We had a massive gridlock this day, throughout the country. The longest in history, despite drivers having been warned off and there actually being less drivers than normal on the roads. The reason was probably that they started a little late to salt the highways, so a slippery road surface caused traffic delays, which in turn prevented the snow trucks from doing their work. This was the reason why some drivers chose the bicycle over the car, despite the cold…. Thomas Schlijper has a video on his website schlijper.nl showing the effect of snow on central Amsterdam (January 15). Nice to see that most cyclists go about their business as always whereas many cars have great difficulty in moving on their summer tyres. I’d love to know more about the salting process. In the UK we always get the excuse that there’s “not enough traffic” for the salt to work. Most authorities take that as an excuse to do nothing. The other issue here is the salting of footways. For days after a snowfall, the footways are treacherous and many pedestrians walk in the road (they have a legal right to do so) to avoid falls and injury. However, drivers see the roads as being fully salted and clear and drive as fast as normal (40km/h-plus in towns). Sorry, ignore above. Just seen second video? No problem, even with that other video not all your questions are answered. But the trick seems to be a combination of brushing first and then to spray a liquid/salt mixture but I do not know what exactly that mixture is. The city has also cleared the main footpaths here. From Central Station to the main shopping area the pavement is all cleared with the same method. I like how the snow brush at 1:14 seems to redirect the brushed snow straight ahead instead of to the side, so they don’t cover the video camera in snow. I wonder how we’ll manage in the UK with tomorrow’s forecast snowfall… I don’t think our cycle paths will be swept, not even National Cycle Network Route 2 which runs along the coast here, carrying 200+ commuters per day even in winter. Perhaps those people will go by car instead, adding 200 cars to the twice-daily traffic jam on the road. How well do Dutch bicycles travel in the ice? Are there many mishaps? You can ride very well in snow and ice on a Dutch bike. There are some tips on how to improve grip (by letting out some air of the tubes) but winter is also the season in which most accidents happen. Conditions are of course worse than in summer. Speeds are low so if young people fall most just get up and start over again. But especially many elderly do suffer from falls. Broken wrists and arms are typical winter injuries. …AND we’re masters the Dry Understatement and Being Polite In A Very Sarcastic Manner, lol! I bet he’s asking because an American would have included some not-so-polite words. I know I did the other day when someone passed me too closely with no warning, just as a giant truck was speeding by. That was a pretty direct communication! 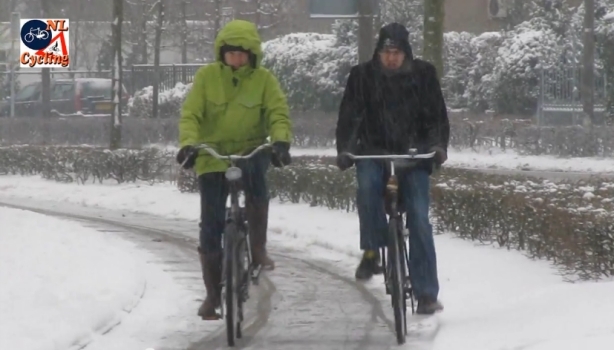 This entry was posted on 17 January 2013 by Bicycle Dutch in Original posts and tagged ’s-Hertogenbosch (Den Bosch), snow, watching people cycling, Winter.